At FOUDY CPA GROUP, PC, a leading Fort Wayne, IN CPA firm, we provide farms and other types of agricultural businesses with a number of valuable accounting, tax, and financial management services. When you work with us, you can outsource all your accounting and bookkeeping functions to us so you don’t have to pay or manage an in-house bookkeeper. Or, if you prefer, we can set you up on QuickBooks accounting software and review your files on a regular basis for accuracy. We'll also provide assistance with inventory management and stabilizing cash flow, and can put together a comprehensive budget to keep you on track. 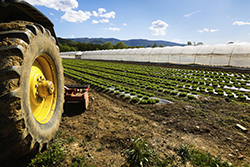 We work with farming businesses in the Fort Wayne, IN area and surrounding communities. We extend a free initial consultation to discuss our farm accounting and tax services so call us at Fort Wayne: 260-432-4565 or Bluffton: 260-824-1040 now.